In Japan, people make a long queue for many things; to get a bowl of delicious ramen noodles at a popular ramen restaurant or just get a train-ride at a busy station. But you’d have never imagined that people also line up even at the altitude of 3,776 meters, the nation’s highest point. I’m talking about Mt. Fuji, Japan’s highest mountain. 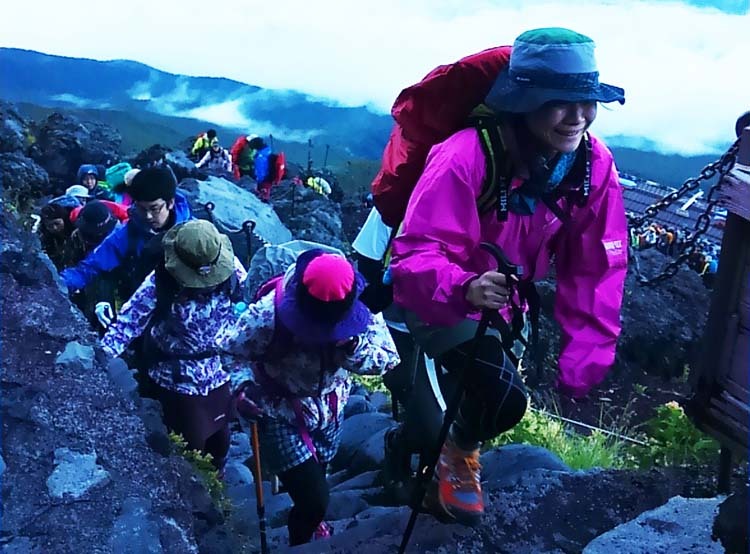 On the last week of August, we climbed the mountain for the first time. 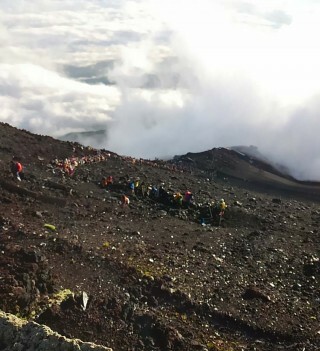 People could climb the mountain until Sep 14th this year. But unlike Okinawa, it gets rapidly colder after September in mainland Japan. So our climbing was almost at the end of two-month long of climbing season. There are mainly four routes to Mt Fuji. We took the Yoshida route, the closest one from Tokyo area. We left the climber station at the fifth point up the mountain around noon and stayed a night at a hut at the 8th point, then reached the summit next morning. While we were climbing, clouds and sunlight changed views of the mountain every single second. It was stunningly beautiful. But the best view saw was dawn, a completely dark sky gradually turning blue while the bright sun appeared from the white sea of clouds. Climbing was not easy but I thought it’s well worth the trouble just to see these spectacular views. A steady line of climbers heading up. drinks and noodles for climbers shivering in cold. As soon as the restaurants opened around 3:30 a.m., people rushed inside to avoid the cold. The restaurants were too small to fit all climbers, and as a result, there were long lines of climbers waiting outside the shops in nearly freezing temperature. Until sunrise time finally came at 5:15 a.m., people kept coming one after another from lower points of the mountain. We saw a long line of lights that people had fixed on their heads in order to climb in the dark. A mile of headlights approaching the summit was also an interesting view, which is characteristic of Mt. Fuji. 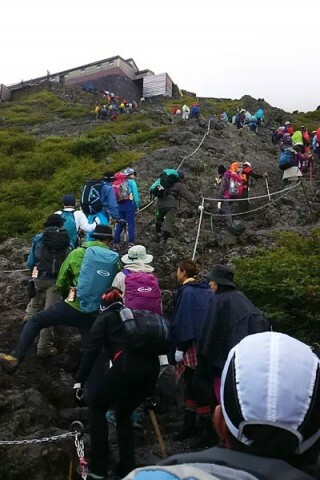 According to the National Parks of Japan, 300,000 people climb the mountain every year. It got more attention worldwide since it was registered as a UNESCO World Heritage site in June 2013, and now a third of all climbers are foreign visitors. The summit of the Mt. Fuji will soon be covered with snow and get into a long winter season. If you stay in Japan until next summer, climbing Mt. Fuji is definitely one of the things you want to try. But if you go there around the peak season, please understand the peak of the mountain most of the time is as crowded as Shinjuku or Shibuya stations downtown Tokyo, and you need to line up just like Tokyo’s salary men do every day, anywhere.